A few weeks back I was contacted by a young business owner named Hannah, the owner of a shop called Fastenation Studio. 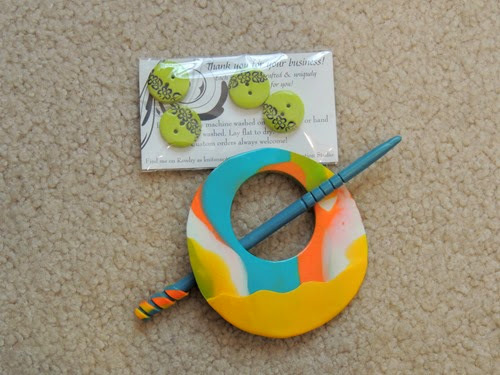 She told me she makes and sells polymer clay buttons and shawl pins and asked if I might be interested in her products. 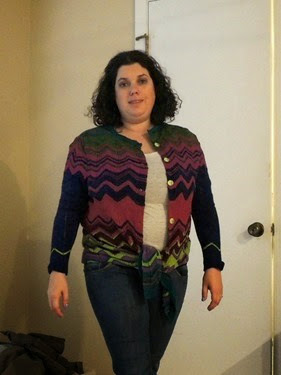 I’m not sure if she knew before she contacted me that I am a knitter, but I was quick to respond and tell her that her products are my favorite type to use in finishing my projects – and I just so happened to have a sweater in need of buttons, plus a shawl that I’d love to wear with a shawl pin! 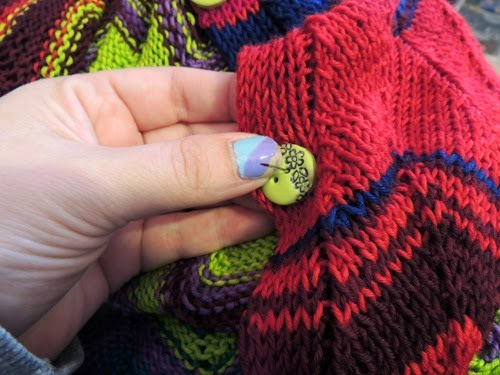 I sent her photos of my projects and she created buttons and a shawl pin for me just from looking at the photos and asking me a few questions about what I was looking for. 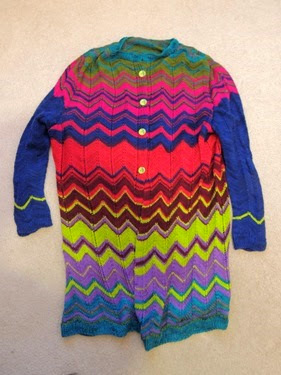 My first project, a brightly colored chevron striped sweater had been finished for awhile, but I had no motivation to find buttons for it, as it came out longer than I’d planned and I was a little unhappy with it. However, when Hannah looked at my photo, she told me she thought lime green buttons would work with the colors and I was so excited to tell her that lime green was the exact color that I myself had been thinking for it! Having worked with this type of buttons previously, I can tell you that sometimes the artists do not leave the button holes big enough to allow a needle to sew through the holes, but I did not have this problem with Hannah’s buttons at all. You may not be able to tell due to the lighting, but I decided tying the bottom of the sweater helped with the length problem! 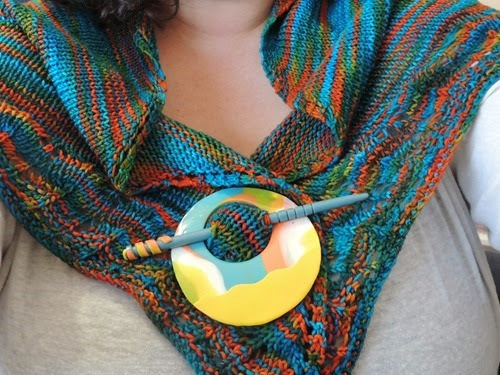 The shawl pin also perfectly compliments the turquoise and orange shawl that I recently finished. I’ve actually never worn a shawl with a pin before, but I’m quite happy with the way it looks! 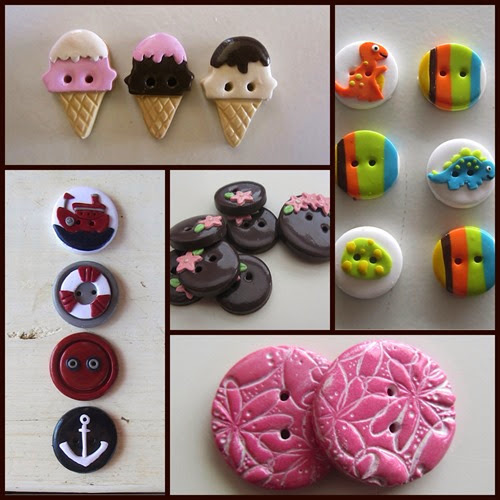 You can find Hannah at the home of Fastenation Studio, her blog, and at her Etsy shop. 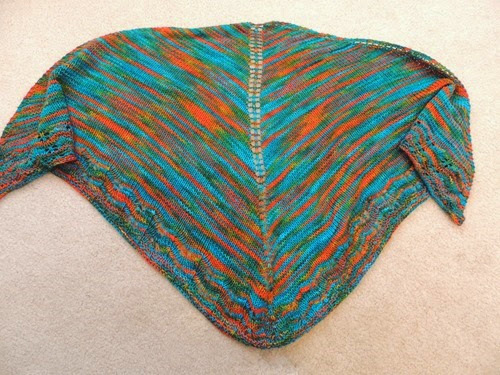 She is also on Ravelry for those of you who hang out over there with fellow knitters! I love the buttons and shawl pins that Hannah made for me and would definitely contact her the next time I need ‘Fastenations” for a project!